(November 21, 2016 — Bethesda, Md.) 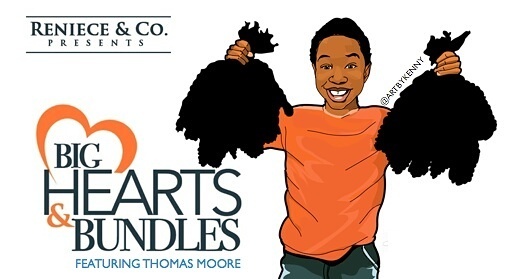 On December 3, the reveal of Thomas Moore’s generous donation of his hair to pediatric cancer patients will take place at Big Hearts and Bundles: Celebrating the Beauty of Giving in Bethesda at The Woman’s Club of Bethesda, located at 5500 Sonoma Rd. Reniece Goodwine, the stylist who cut Moore’s hair and used it to construct wigs for pediatric cancer patients, is producing and hosting the event. Goodwine, the owner of Reniece & Co., an upscale salon in Rockville, will present the masterpieces that she crafted from Thomas’s beautiful bundles of hair. “Whether you’re looking to grow your hair to donate or to keep, your attendance at Big Hearts and Bundles will make a difference in the lives of many young cancer patients,” Goodwine said. In September 2016, millions of people fell in love with Moore, the thoughtful 10-year-old boy from Bowie who grew his hair down to his waist so he could donate it to children with cancer. Now, it’s time to reveal the results of Thomas’s wonderful gift. This unique charity fundraiser will feature a video presentation and brief interview with Moore. It will also include a frank discussion about the hair-donation industry — especially as it pertains to African American hair. Stylists and hair care professionals of Reniece and Co. will also be present to answer questions and address feedback. Ticket sales and funds raised at the event will be used to directly help the families and organizations that are being honored, particularly the the Kyssi Andrews Foundation for Pediatric Cancer. The goal is to be able to help even more families as donations grow. People in attendance will get to meet and share stories of hope and perseverance with the families of children with cancer. Big Hearts and Bundles: Celebrating the Beauty of Giving is sponsored by Reniece & Co., Monetize Thyself, Natural Encouragement, LLC, Point Wellness Spa, Kibibi Hair and Salon Tamika Bell. Doors open at 12:30 p.m. The event is from 1 p.m. to 3:30 p.m., and lunch will be served. If cancer has affected you or someone you love, please consider attending this heartfelt event. For more information, please visit www.bigheartsandbundles.org. Remember the Social Media hashtag: #bigheartsandbundles!!!! !